Allman Reynolds has received instructions to offer to the market an outstanding property in the heart of Salthill. No 77 Baily Point is a fantastic second floor two bedroom apartment overlooking Salthill Promenade with panoramic views of Galway Bay. Baily Point was built circa 2004 and continues to be an extremely popular development due to its excellent location in the centre of Salthill. Allman Reynolds has recently sold a number of apartments in this development and in the Salthill area both on and off market, achieving well in excess of the asking price on each property. Salthill is a prime location with the famous Salthill Promenade on its doorstep and excellent local amenities including shops, bars, restaurants, and schools. Galway city centre is also a leisurely stroll away. 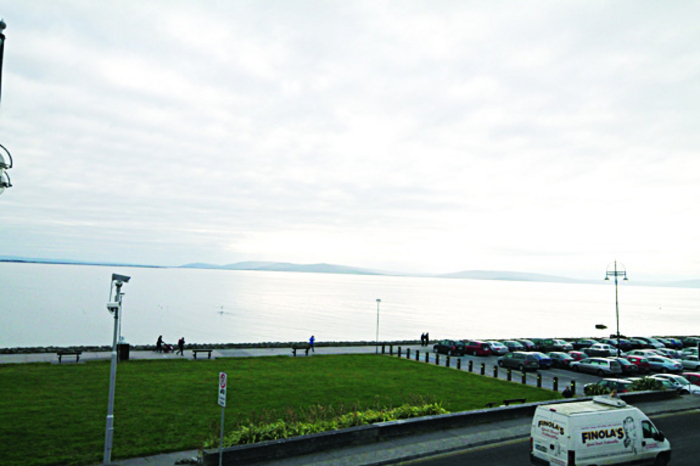 The bright and spacious 620sq ft apartment enjoys a south-facing balcony which commands expansive views of Galway Bay. The property has a generous sized entrance hall with oak wooden flooring throughout the apartment. The modern kitchen/dining area is fitted extensively with beige Shaker style wall and floor units, sleek black granite work surfaces, and integrated kitchen appliances. The light filled living room has double doors which lead on to a small balcony overlooking the Salthill seafront and Promenade. There are breathtaking views from the living room, kitchen, and en suite bedroom. The sleeping accommodation consists of two spacious double bedrooms with one master en suite with fitted wardrobe. The main bathroom is tastefully finished with tiled walls and floors and a bath with electric shower unit and screen. There is storage heating throughout the apartment. The apartment has a BER of C1. Management fees are approximately €1,475 a year. The apartment is presented in impeccable condition and would be an ideal holiday home or a super find for a professional couple or any first- time buyer on the look-out for a modern and elegant apartment in a prime location. This is a quality investment and offers excellent value with asking price of €120,000. Viewing is by appointment only and comes highly recommended by the auctioneer Oisin Allman.